He set up this web site http://www.it.wkrakowie.org. When Ramon Tancinco and others discussed this years ago he set up this . The Cambridge Phenomenon took 50 years. It takes time to build a community. 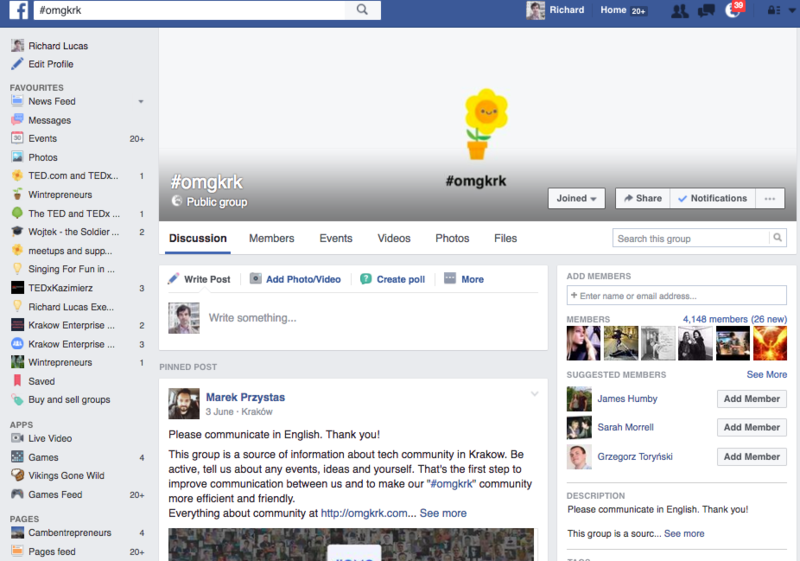 The OMGKRK Facebook group has over 4000 members. It’s the place to post latest news and find out what is going on in Krakow. It is in English (see note below) because Marek Przystas wanted Krakow to be internationally successful and for the group to be relevant to the world (not just locals). Dominik Dryja takes a bow as the founder. 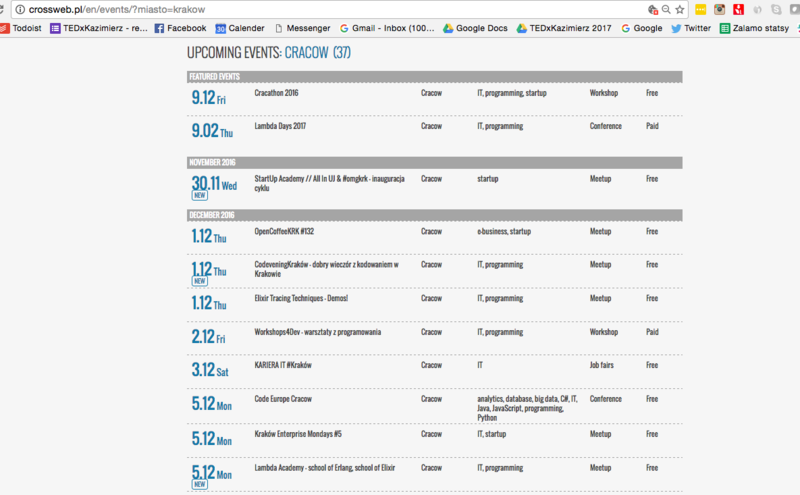 There are specialist events going on all the time as the screenshot shows. Some big annual events like the big OMGKRK X Massive events, Aspire Annual meeting, Smogathon, Ebiz and Boss Festivals, Global Entrepreneurship Week and Startup Weeks, Bitspiration, recently more visible in town thanks to the new accelerator Bitspiration Booster and Product Development Days. (not to mention the impressive TEDxKraków and (modestly) TEDxKazimierz. Should events be in English (lub po polsku ) or in Polish ? Ważne pytanie/good question. The answer is both. If you are only trying to reach people who speak Polish, are too shy to attend a meeting where they might meet a foreigner, or simply believe that events in Poland ought to be in Polish, and discussion will be better in Polish then events can and should be held in Polish. However,, as Willy Brandt said “If I want to sell to you, I speak English, if you want to sell to me, denn mussen sie Deutsche”. It’s not a good idea to expect global clients to speak Polish, to require fluent Polish of your international staff from the start or to forget that foreigners are intimidated by Polish. If event organisers have the ambition to be globally significant, want to encourage international arrivals in Krakow to feel welcome and attend your events, English is better. 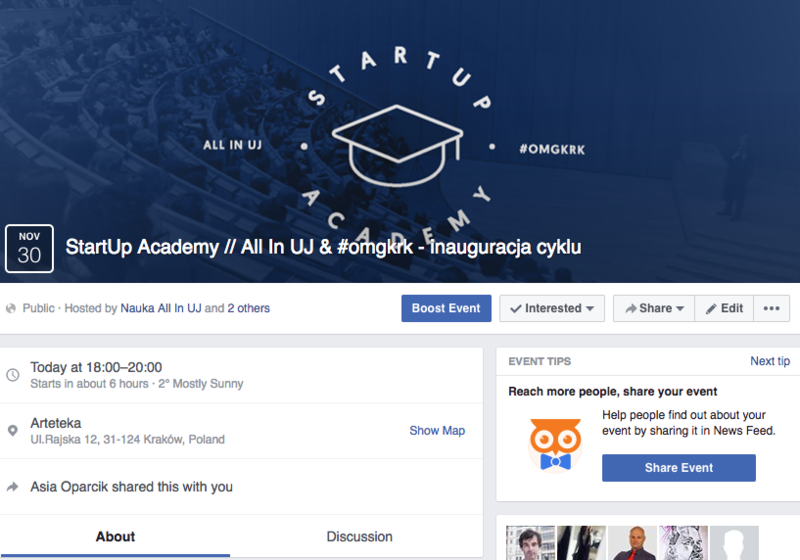 It’s vital to bring more students into the startup community., please give Tomek and the All in UJ team all the support you can for this important new initiative.